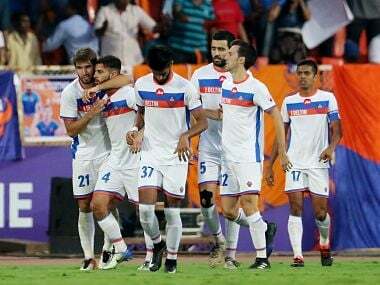 Pune: Leading goal-getter Ferran Corominas struck twice in the second half as FC Goa produced top-drawer stuff to rout FC Pune City 4-0, keeping their play-off hopes alive in the Indian Super League football encounter on Sunday. 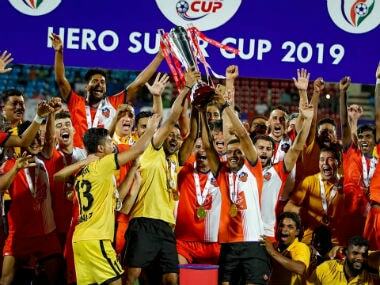 Needing nothing less than a victory to stay in the hunt for the semi-finals in their 16th round game, Goa took a solitary goal lead in the first half lead through a penalty converted by Spaniard Manuel Lanzarote (28th minute). 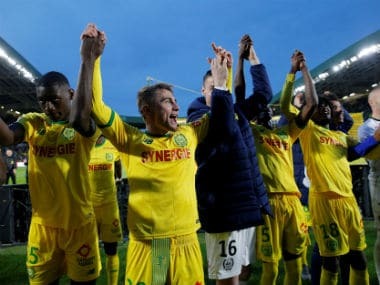 The floodgates opened in the second half as they got three goals more through Frenchman Hugo Boumous (47th) and Spaniard Corominas (58th and 65th a penalty) to end their five-game winless streak in style. The resounding victory, which was also Goa's first clean sheet this season, lifted them to the sixth spot with 24 points under their belt while Pune remained one rung behind table toppers Bengaluru FC. 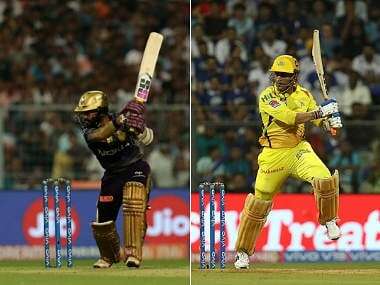 Pune stay put on 29 points with a game in hand to seal their play-off berth. 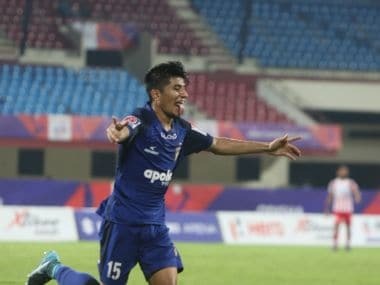 In an action-filled but rough first-half played at the Shiv Chatrapathi complex in Balewadi, FC Goa were awarded a spot-kick in the 28th minute following the tripping of Boumous inside the penalty area by Adil Khan as he was about to connect a lovely cross from Carominas. Lanzarote aimed at the left bottom corner of the net, as Pune custodian Vishal Kaith dived the other way. Earlier, Pune were unlucky as the woodwork came to the rescue of Goa in the 11th minute to deny Sahil Panwar's header, off a free-kick by their star Brazilian striker Marcelinho. It hit the upright and went out. As many as six yellow cards were dished out by referee Pranjal Banerjee in the first half itself with four bookings done against the visitors Boumos, Lanzarote, Pranoy Halder and Moroccon Ahmed Jahouh. The other two bookings were against Pune midfielder Diego Carlos and Marcelinho, for showing dissent at the referee's decision who denied the home side even a free-kick after the Brazilian was brought down on the edge of the box by Sergio Juste Marin of Goa. To compound Pune's misery Marcelinho was booked for the second time late in the game and had to leave the field. The Brazilian, who has scored 8 goals, will not be available for the next away fixture against Delhi Dynamos on 2 March. The Pune skipper had a poor game as he also missed a fine chance to restore parity in the 41st minute by essaying a weak left footed shot from well inside the box, off an excellent cross sent in by compatriot Carlos, which was easily collected by Goa goalie Naveen Kumar. Goa did have the slight upper hand in the half itself with the excellent combination of Frenchman Boumos and Spaniard Corominas who laid the perfect pass for the former to score the second goal of the game soon after the start of the second half. Boumous, after muffing the first pass from Corominas with a weak shot, shook the cross bar with the second and then immediately afterwards uncorked a powerful left footer off a centre from the right by Corominas to which Pune goalie Kaith got both hands and then let through in the 47th minute. Corominas himself scored the next two goals to finish off the game in Goa's favour. He made a brilliant run on the right, cut past a defender and then slotted the ball from an acute angle to beat Kaith under the Pune bar. The Spanish striker then stepped up to the penalty spot and beat the Pune goalie again with calm assurance after the home team's defender Sarthak Goulai handled the ball inside the area off a Mandar Desai centre. The two goals took his tally to an impressive 15 and put him firmly in line for fetching the Golden Boot award while the resounding victory also kept the qualifying hopes alive of Goa who meet ATK in their penultimate game at home on 28 February.